A former engineer stated that the author's first edition contained more alignment information than the sum total of all other works in the Library of Congress. 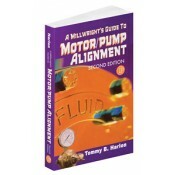 This second edition is the result of over 38 years of hard work and many thousands of hours writing, testing, retesting, and testing again the alignment-related formulas the author has developed on his own. It will make users' work much easier and will assist them in making many dollars. It is sure to be valuable to novices and professionals alike! You are holding in your hand the most complete and comprehensive volume on this subject ever written. This statement is supported by a former engineer who had been given the task of searching the Library of Congress for shaft alignment material concerning various motor and pump alignments. The engineer stated that Tommy's first edition contained more alignment information than the sum total of all other works in the Library of Congress at the time of his research. This second edition has been a monumental undertaking from the outset and is the result of over 38 years of hard work and many thousands of hours of writing, testing, retesting, and testing again the alignment related formulas that he has developed on his own. Written by a mechanic for mechanics in a mechanic's language. Provides loads of information, common sense tips, and methods and formulas that have been around for decades. Offers the "how-to's"; along with the drawings, the formulas, and mathematical examples that address the "who", "what", "when", "where", "why", and "how" in several dozen realistic incidents involving alignment work. Features valuable hints, practical tips, comments, and cautionary notes throughout to drive home each point. Covers at least 99% of the field alignment problems encountered by most mechanics. This book is only a tool. It can no more make the alignment for you than the wrench with which you have unbolted the motor. But with this book, after you have taken an accurate set of dial indicator readings and allowed for the pre-determined sag factor, you don't have to wait for “the bottom of the ninth” to get that grand slam win. Many times I've seen it happen on the first shimming. And now very often, so will users of this book.